120 Multiple Choice and 120 Free Response Questions in movie order plus 7 Essay / Discussion / Project Prompts, along with full answer keys & teaching notes. Instant, easy differentiation built in with multiple choice and free response items parallel so you can pick what's best for your students! Sicko, released in 2007 by famed documentary-maker Michael Moore, addresses the crisis in health care in the United States. The film heavily focuses on the problems of Americans who actually have health insurance – but it is insurance that in many ways leaves them in the lurch when they have a major problem. 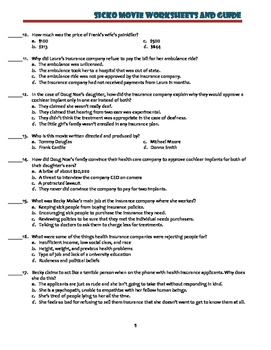 You will get 120 Sicko movie questions, all presented in video order so that students can follow along, answering as they pay attention to the movie – though it is equally possible to use the questions after viewing as a test or quiz follow-up, or even as a way to review content and spur class discussion. 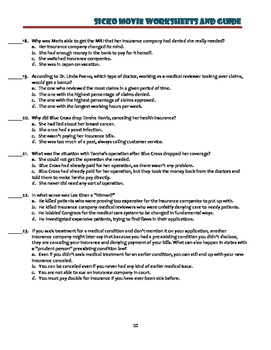 All questions are provided as both multiple choice and free response problems. You will also get 7 follow-up topics to get students thinking more deeply about the movie's issues so they can formulate their own points of view. These topics work equally well for debate and discussion, essays, and projects, giving teachers a lot of flexibility. Full answer keys are provided, along with detailed introductory teaching notes as well as guidance notes on the discussion and essay topics. EASY DIFFERENTIATION WITH BOTH BASIC AND ADVANCED LEVELS PROVIDED! All 120 questions are provided in both multiple choice and free response formats so that teachers can easily differentiate, with both basic and advanced worksheet versions available at their fingertips. Questions are numbered sequentially so that teachers can start and stop the movie whenever it suits them, instead of trying to match their instruction to worksheets that divide the movie up into pre-established segments. •	It provides an in-depth look at a market failure. •	It examines the relationship between incentives and results, demonstrating the axiom that “people respond to incentives.” For example, the film points out how British doctors are paid more when they cause their patients to become healthier, while American doctors in some cases actually receive bonuses for denying care to sick people. •	It contrasts the American for-profit health care system with the socialized systems prevalent in much of the industrialized world, giving teachers an excellent launching pad for discussing socialized versus privatized systems of delivering services. •	It demonstrates the ways in which the United States is very much a mixed, not a pure free-market economy, with socialized delivery of many services including police and fire protection. •	It shows the strong relationship between campaign contributions from big business interests and the policies that politicians end up promoting when in office. •	It examines the connection between public policy and large-scale advertising to influence voters’ preferences. •	It asks why the United States does not have a government that works more to the advantage of the ordinary citizen. Sicko came out before the Patient Protection and Affordable Care Act, more informally known as Obamacare, was enacted into law. Despite that, the film is still a great one to show since the Obamacare legislation did not address a great many of the problems plaguing the American health care system. 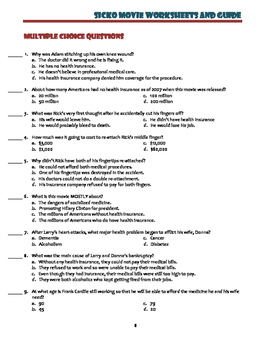 The movie guide has detailed teaching notes to help teachers address the issue of what Obamacare *did* solve and how its solutions have in turn spawned other problems and issues. Obamacare or no, Sicko remains a highly relevant movie because its much larger concerns focus on comparing the United States to other Western democracies to examine how well our economic choices benefit the average citizen. Sicko shows how single-payer health care systems function and asks why the United States has chosen to socialize so many other basic services, including education, yet remains focused on delivering health care in the for-profit mode. It’s a great way to get students thinking and debating about these issues. What’s more, the film makes it easy to help students understand that “socialism,” as the word has been used in Western Europe for decades, is NOT the same thing as Soviet-style communism. Sicko suggests answers to all these questions, of course; Michael Moore has his own point of view and this is evident in the movie. Its great usefulness in class, however, is not because Moore has all the right answers, but because he asks great questions that will cause students to think critically as they prepare to enter the adult world and become voters. 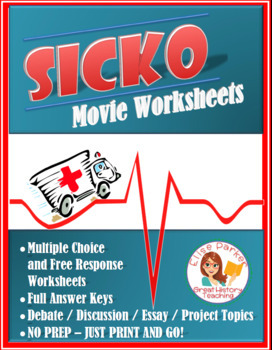 Sicko Movie Worksheets are a great addition to economics and government classes because they help to trigger discussion and debate about the proper role of government in the lives of its citizens. Whether students are conservative or liberal, these issues are important to think through – and in my view, it’s just as important for all students to understand that whatever their political leanings, there will always be Americans with opposite views. Understanding that each side views its own perspective as perfectly valid is one key to living in a pluralistic democracy such as our own.